Reisenberg and Associates is a Certified Public Accounting Firm with full service accounting, providing financial services to both individuals and businesses. We give the same attention to all clients, no matter how large or small. The accounting, tax preparation,business consulting, and other financial services we provide are tailored to the unique needs of each client, helping ensure the best possible results and maximized returns. We are a QuickBooks Pro Advisor offering training, installation, setup, and tips. We are well-informed and continually adapt to the ever-changing world of tax law and accounting. 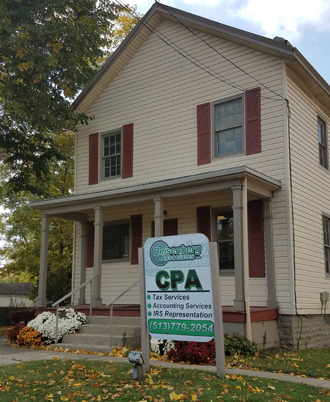 We are also a member of the Ohio society of CPA's, and American Institute of Certified Public Accountants. Our Commitment At Reisenberg &Associates, we treat our clients with courtesy and integrity. We provide efficient, honest tax service that achieves remarkable results at reasonable prices. Our years of experience and expertise ensure that your tax preparation and accounting services are in good hands. We are located at 9003 Cincinnati Dayton Road in West Chester Ohio, 45069. Right across the street of St. John's Church. -Take 75 N to exit 19 Union Centre Boulevard Fairfield. Turn right onto Union Centre Boulevard . Turn left onto Cincinnati Dayton Road. Cross over West Chester Road and we are located on the left at 9003 Cincinnati Dayton Road.